Pedal on Parliament (PoP) is a grassroots campaign for safer cycling. 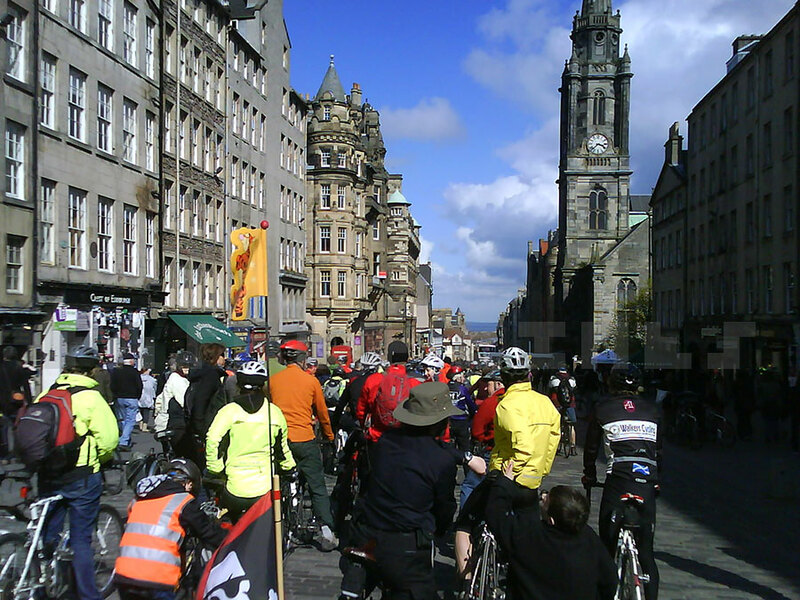 Their original annual ride goes to the Scottish Parliament, as the name suggests. The organisers put loads of helpful information on the Pedal on Parliament website, PoP Facebook group and PoP Twitter account. However, I thought it was worth doing a ‘view from the pack’. This is part personal story and part ‘how to’ guide. For your own sake (or your family’s) – more people showing support on the day keeps up the pressure for improvements. Some of those could end up on a street near you. The event doesn’t dwell on the politics, it’s more about bringing together people who cycle (and walk). Bicycle majority – if you’ve ever cycled, and wondered what roads would be like if they weren’t dominated by cars, then you should go to PoP. It’s great to be amongst several thousand people on bikes or on foot. Route closed to motor traffic – even wee kids can ride their own bikes through the city centre. That also means a wider variety of people, which gives PoP a nice atmosphere. Since Edinburgh is the home of the festival, you get some characters dressed up, on stilts, etc. Celebrity spotting – previous years had Mark Beaumont and Graeme Obree. There are also some local and national politicians on bikes. Bike spotting – the best place in Scotland for it. I’ve never seen the same variety of bikes anywhere else. Back in 2012 I had my Charge Steamer, a cross between a ‘Dutch bike’ and a cruiser, with really wide handlebars. It was the first ever PoP so I didn’t know how busy the trains to Edinburgh would be. I had a bike carrier for my car so I decided to drive through. I think I came in from the Bypass along Morningside Road then went east. I took a few wrong turns so ended up a bit neat for time. I parked in a neighbourhood south of the city centre and rode up the hill (Lauder Road, I think?). 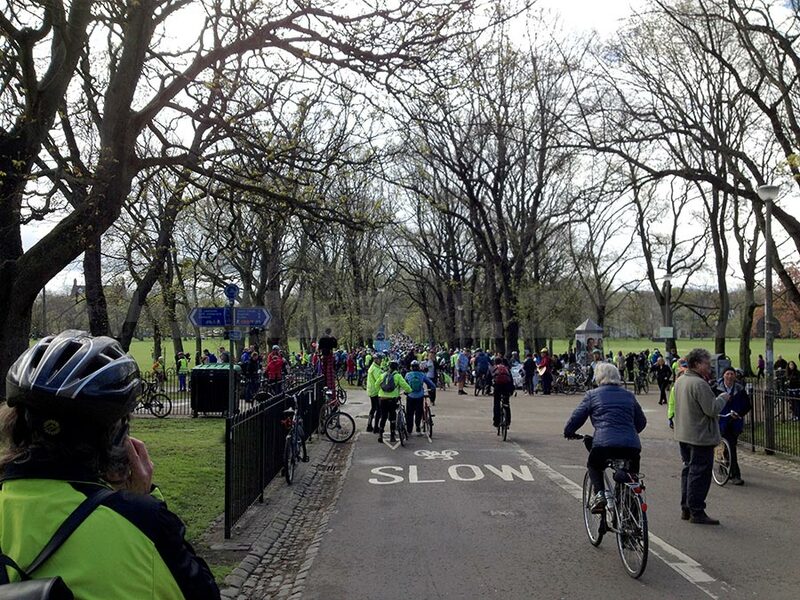 The Meadows is a magnet for cycling, walking and running (similar to Glasgow Green in Glasgow). When the park came into view, the whole path down Middle Meadow Walk was filled with a multi-coloured queue. It then turned the corner and kept going halfway down the path alongside Melville Drive. I’d thought PoP would be popular but was surprised by how many people were there. I joined the queue and put up my home-made flag, which became a talking point. I don’t think I saw anyone I knew but I chatted to a few folk and enjoyed being with so many cyclists in one place in Scotland. In 2013 I decided I wanted to go in a group so rashly signed up to a ‘feeder ride’ from Glasgow. I’d done rides of 20–30 miles with Go Bike but Edinburgh is over 40 miles from Glasgow. The ride was organised through the CycleChat forum and followed a similar route to Pedal for Scotland, through Airdrie and Linlithgow. Unfortunately, they weren’t copying Pedal for Scotland’s rest stops, which would’ve made it much easier. I’ve since ridden the railway path from Airdrie to Livingston and I preferred that route (NCN 75). The group members were on hybrids or road racing bikes so my heavier 3-speed put me at a disadvantage. I made an effort to keep up but paid for it on the stretch towards Linlithgow. After a stop near the station I struggled a bit on the next stretch until we reached the outskirts of Edinburgh. We came in on the bike path from Crammond and arrived at The Meadows to meet the Glasgow Belles on Bikes feeder ride. I was asked to take a photo of them (which I later saw in print!) and promptly lost my group. I tagged along with some of the Belles instead. They knew the way back to Waverley so I went for an early train back to Glasgow. I had my current folding bike by 2014 so I took the train from Glasgow Queen Street. I did the same in 2015 – I meant to be early but ended up getting the last (or second last) train that would get me to Edinburgh on time. Both years turned out the same: me and one other cyclist, with a Brompton, got off at Waverley and queued at the wider ticket barrier. Since my knowledge of Edinburgh is patchy, I asked if they’re going to The Meadows and can I follow them? Luckily both times they’ve answered ‘yes’! Since I went to Edinburgh for the City Link festival my geography has improved a bit so I’m slightly better at finding my own way. Waverley hasn’t been a bike-friendly station but it’s closer to The Meadows than Haymarket (and doesn’t have slippery tramlines right outside). The road ramps up to the bridge are blocked. Correction: The road ramp nearest to Market Street is blocked at the top by a security barrier. The ramp closest to Princes Street has a bike lane to ride up to street level (then turn left to go to Market St). In 2015, I lost the Brompton rider at traffic lights but knew roughly where I was so I could find my own way. Arriving from the north end of Middle Meadow Walk gives you a good view of the queue. It also meant that, while I was heading for the back of the line, some Go Bike people spotted me so I joined up with them. I don’t mind the wait in the queue as I like seeing the variety of people and bikes. You usually get to chat a wee bit with the folk around you. Some of the younger kids get a bit bored so you see some parents riding around to try to keep them entertained. You’re meant to leave one side of the path clear so people can get past. If you’re going to walk the route you need to be on time and right up at the front. Further back in the queue there’s no way you can hear what is going on at the front. At some point you’ll hear people ringing their bells and join in. I’ve never been sure if this marks the start of the ride or not? You don’t actually move until a minute or two later. You’ll think you’re about to go then nothing will happen. Then a space will suddenly open up in front of you and everyone starts off. You’ll probably just be getting going when you have to hit the brakes and wait again. There’s a concertina effect so you’ll stop and start a few times if you’re towards the front. Further back, this can happen a few more times before you get up the hill. Rest assured, the front of the ride will reach the Parliament before the back of the line even gets out The Meadows! Once you pass the bike counter on Middle Meadow Walk you’ll cross a traffic island onto Forrest Road. It’s closed roads from here on apart from one crossing (PoP site has full route details). There’s usually more space after here and you naturally want to speed up. Personally, I think it’s good to take it easy and soak up the atmosphere. You usually get a few waves from passers-by so the stretch along George IV Bridge is quite enjoyable. If you’re with a group, you can often lose sight of them on the road as you mingle with other riders. It’s a good idea to have the odd look round for them as you go along. Most people assume they’ll find each other later but it can be easier said than done. 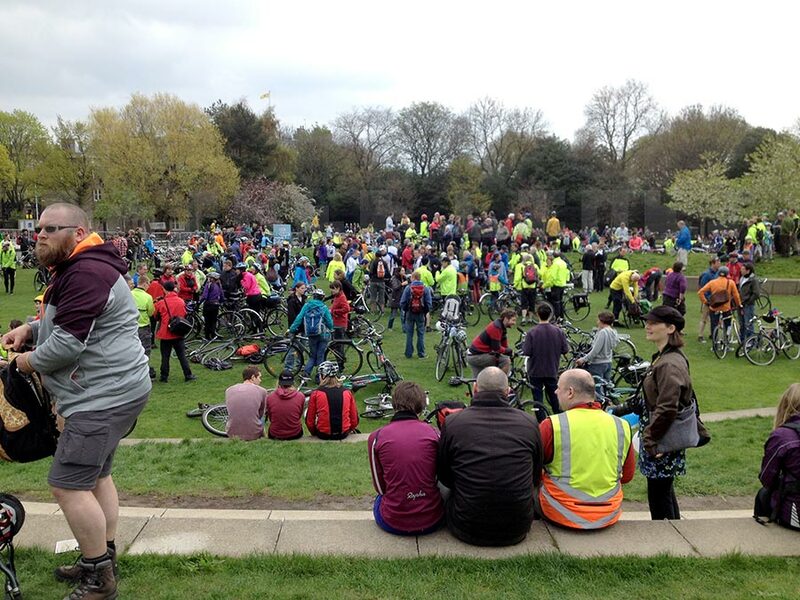 It turns out the easiest way to lose a cyclist is in a massive crowd of other cyclists! You take a right turn onto Cowgate and may have to mix a bit more with pedestrians. Further down, everyone usually gets stopped at one of the junctions. This can take a wee while and be a bit ‘stop/start’ again. If no sound system is stopped with you, there is a slight risk of an outbreak of ‘Bicycle’ by Queen. One year someone tried to start a chant at this point but I think most PoP people are too shy/polite to join in. If you’re used to big political marches PoP may seem a bit subdued by comparison. However, how many other demos have toddlers on balance bikes? After South Bridge you can whizz down the hill towards the roundabout. Once you go round and turn right, you’re at the parliament. 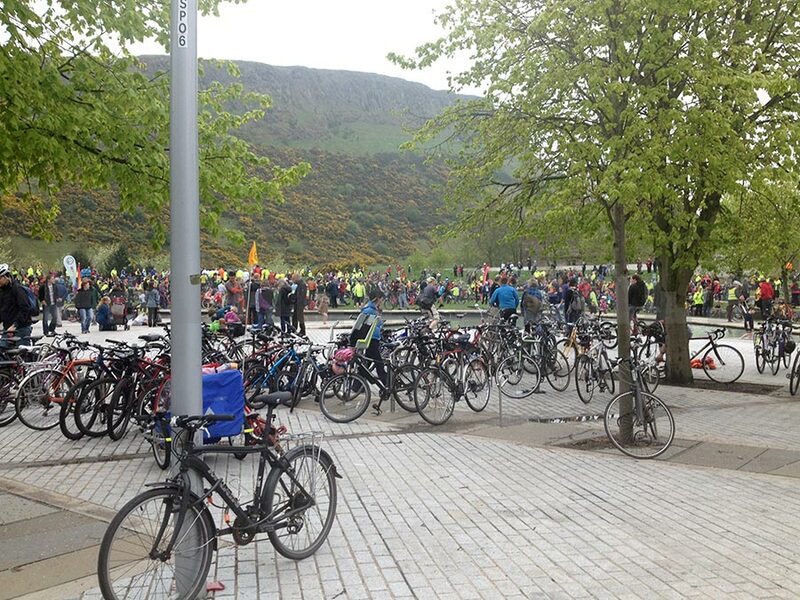 Everyone heads towards the grass to find somewhere to leave their bike. You don’t have to worry too much about security, just hang out. There’s time before the speeches to chat, wander, eat, buy a t-shirt or paddle (if you don’t mind manky water). Whether or not you hear the speeches depends on where you are. The sound system has been better in recent years so they should be easier to hear than 2012. There’s usually half a dozen or so to get through but they’re all quite short. After that you’re pretty much left to your own devices. The first two years I just headed home pretty much straight away. In 2014, I stopped at a cafe before getting the train home – more civillised than a coffee at the station. In 2015 and 2016 we had a pint before heading for Waverley but I don’t usually stay long. You realise the difference in the roads as soon you try to ride back up the Royal Mile after PoP. It’s re-opened to traffic so the first stretch can be busy and it’s fairly steep. If you’re going back to Waverley station, turn right and follow Jeffrey Street round to Market St (under North Bridge). This post has been updated to clarify it’s about the Edinburgh event. 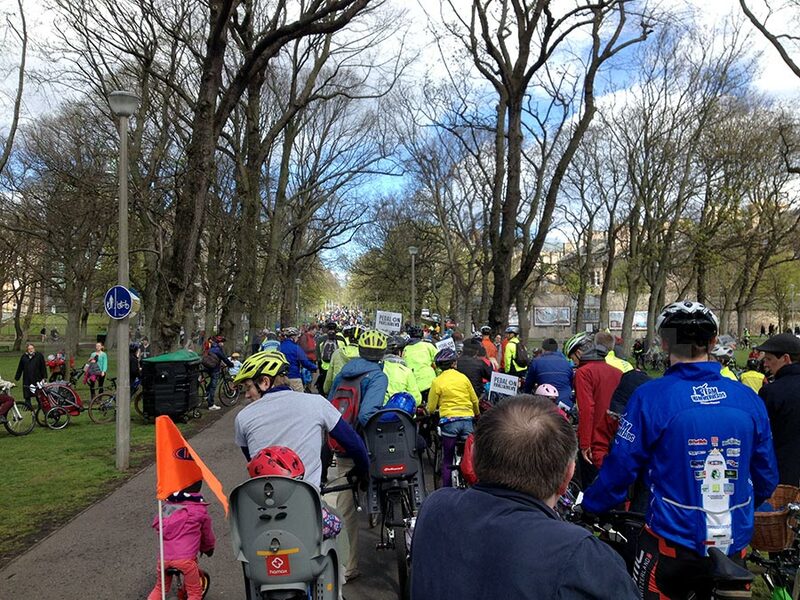 PoP has spread to several Scottish cities – see the Pedal on Parliament website for details of the other events. The good news is that you can now ride your bike up the ramp out of Waverley! Thanks for that – it will help on Saturday! At Waverley station, you can now cycle up the ramp closest to Princess Street, so no need to carry bikes/use the lift. Thanks for letting me know – post now updated.